When her husband left her for a younger woman, Rose Franklin bought a camper and started traveling. Eventually, she put down roots in Shady Grove, a campsite along the Mississippi River in West Memphis, Arkansas, where she has lived for almost two years now. After helping to solve two murders in the area, Rose is now entangled in the murder of a young man from South Dakota—a murder which Chariot, a young woman at the Shady Grove campground, stands accused. As Rose tries to help her friend Chariot out from under the shadow of suspicion and solve the murder, she also struggles with unresolved maternal instincts, and her own difficult choices. 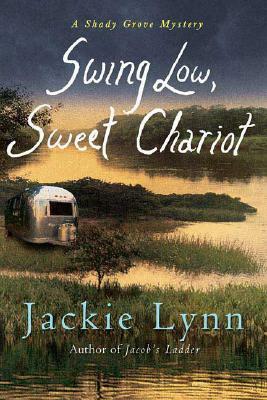 A spiritual and riveting follow-up to Jacob’s Ladder, Swing Low, Sweet Chariot is ultimately a story about redemption, and the chariots that carry each of us from hardship and darkness, to understanding. JACKIE LYNN is a writer and journalist. Writing under the name Lynne Hinton, she is the New York Times bestselling author of Friendship Cake, as well as the author of Hope Springs and Forever Friends (The Hope Springs Trilogy), among other books, and writes a monthly column for The Charlotte Observer. She lives in New Mexico. Visit her Web site at www.LynneHinton.com. "Lynn elevates the genre with her blend of philosophy, romance, spirituality, and elegant writing . . . This is a truly lovely book to be read slowly, savoring life by the river in the cool shade." "Lynn's accomplished debut mystery is a righteous blend of spirituality and suspense." JACKIE LYNN is a writer and journalist. Writing under the name Lynne Hinton, she is the "New York Times" bestselling author of "Friendship Cake," as well as the author of "Hope"" Springs" and "Forever Friends" (The Hope Springs Trilogy), among other books, and writes a monthly column for "The Charlotte Observer." She lives in New Mexico. --Katherine Valentine, author of Haunted Rectory, and the award winning Dorsetville series.